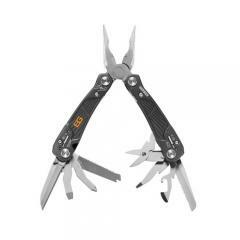 Gerber pulls out all the stops with the Bear Grylls Survival Ultimate Multi-Tool! Crafted from weather-resistant stainless steel, the durable tool can withstand use in extreme climates and tactical conditions. The Multi-Tool features twelve essential components, including the following: fine and serrated edge knives, saw, small and medium flathead screwdrivers, Phillips head screwdriver, bottle and can openers, scissors, wire cutter and spring-loaded needle nose pliers. The spring-loaded jaw allows for convenient one-handed deployment of tools, while Gerber's patented Safe.T.Plus System locks each component in place, securing it during use and preventing potential injury. Ergonomic, textured handles offer comfortable and controlled handling of tools without worry of slippage. The Survival Ultimate includes Bear's survival guide and Land to Air rescue instructions. A lanyard hole and military-grade, mildew-proof nylon sheath allow for convenient storage and transport options. Couldn't be more pleased with this compact, utility multi-tool.